A San Jose police-led task force took down a highly organized drug operation in San Jose and Sunnyvale last week, seizing massive amounts of narcotics and money and arresting four suspects, according to a police department release Wednesday. 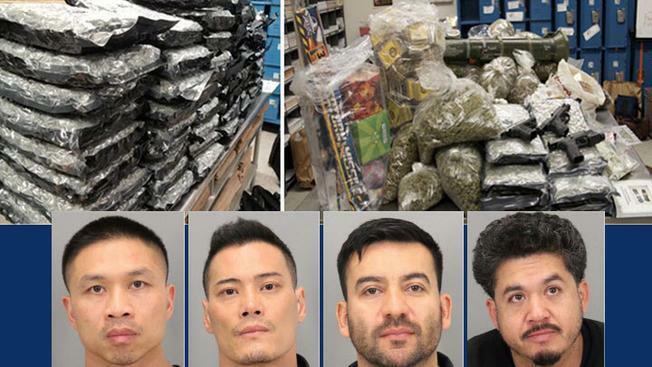 San Jose residents Anthony Le, 42; Barry Phan, 42; Jose Garcia, 41; and Alejandro Garcia, 35 were arrested Nov. 28 and booked into Santa Clara County Jail for various charges, including manufacturing and transporting of narcotics and possession of illegal weapons, police said. In a two-year-long investigation, the task force, which included units from San Jose, Sunnyvale, Santa Clara County and federal agencies, raided two operations in the South Bay as well as warehouses in four other states, police said. Raids in San Jose and Sunnyvale recovered more than 800 pounds of marijuana, a large amount of illegal anabolic steroids, 5 ounces of concentrated hash oil, powder cocaine, Xanax bars, Ecstasy pills, three handguns and an expended rocket launcher. Numerous bank accounts also were frozen, and $600,000 was seized, police said. A lawyer for one of the suspects said the rocket launcher was a relic he brought back from Iraq after serving there during the war. The gang was manufacturing and selling the drugs throughout San Jose and the Bay Area, as well as transporting narcotics across the country to the Southern and Eastern parts of the United States, police said. "In New York, in Tennessee, in other various locations, it isn’t legal. So they can get a premium for California marijuana in these other states," San Jose police Lt. Paul Messier said. Police said an anonymous tip first alerted them to the operation, and they are working with federal agents to track down more suspects in other states. Anyone with information about the suspects or the operations should contact the San Jose Police Department’s Special Investigations Unit at 408-277-4041. Persons wishing to remain anonymous may call the Crime Stoppers Tip Line, (408) 947-STOP (7867).